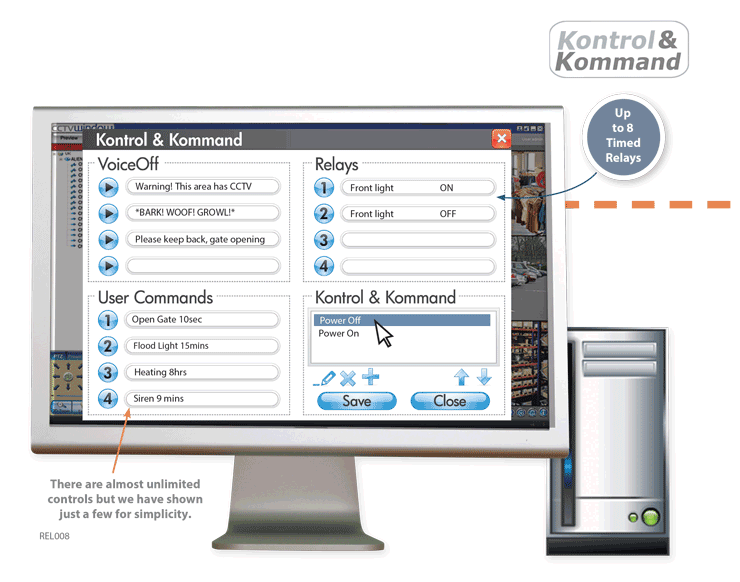 The Kontrol & Kommand module allows remote control of third party electrical equipment/systems via the AlienDVR and our Free CCTVWindow software. How it works - The CCTVWindow software sends “Kontrol” signals to the DVR that then forwards them on to a Kontrol & Kommand module. 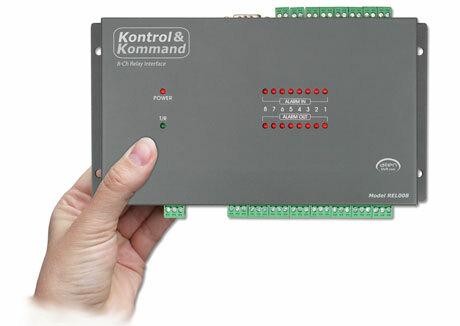 Each K&K has 8 separate relays that the software can control. The relays can be made to open or close for adjustable lengths of time, all programmable by the user. For example, you can send a signal via the CCTVWindow software to the DVR to open RELAY 1 for 2 minutes, you may use this to open a gate for a visitor. Or you may send a signal to RELAY 9 (second K&K module) to close for 3 hours which overrides a central heating controller so the building is all toasty when you get there. You might even trigger RELAY 3 to open for 9 minutes to trigger a siren because you have spotted intruders. See previous pages for diagram. You can name each function and button in the software so that once it's set up and configured it's really easy to use. 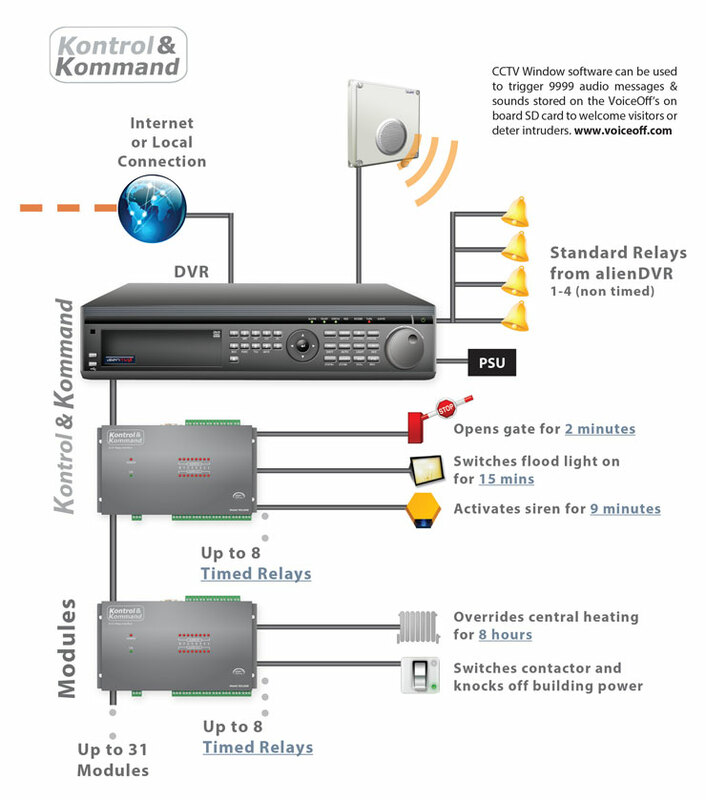 The big benefit of the Kontrol & Kommand unit over the DVR's own relays is the ability to control the time each relay is open or closed for. You can even assign “groups” to the relays. Up to 31 K&Ks can be connected to each DVR allowing for great flexibility on installations in large buildings. The same CCTVWindow software is used to control the VoiceOff module as well allowing you to trigger up to 9999 pre-recorded sound files that the VoiceOff can store. There's no wonder it's the product of choice for many of the UK's leading installation companies. Summary – Adds many additional uses to control equipment and is perfect for a home/business automation interface.